1. Paula’s Choice Skin Perfecting 8% AHA Gel Exfoliant -- I think this is one of those products you have to use for awhile to see the full benefits, however I do notice the exfoliation effect. It gives my skin a smooth glow. It's also supposed to fade dark spots, which probably comes with using it for a longer amount of time. I'll put this in the maybe category for a future purchase, although this sample was pretty generous so I'll be using it for awhile. 2. Anastasia Beverly Hills Clear Brow Gel -- I tried it and it serves its purpose...I guess. I don't really know. I've never used brow gel before. I don't focus much on brow styling, or whatever you want to call it. I doubt I'll use this very often and definitely won't be purchasing it. 3. Supergoop!® Daily Correct SPF 35 CC Cream --I like this! Light coverage, not greasy but not too matte, not very thick. I like that it doesn't really feel or smell like sunscreen, and it doesn't sting around my eyes (a common problem for me). I've tried so many of these BB/ CC creams, tinted moisturizers, etc that it's hard to pick my favorite. The note in Birchbox said it can be used as a primer and/or foundation, but I don't think it's quite enough coverage for a foundation unless you like much less than full-coverage. 4. Color Club Gala's Gems Collection in Breakfast At... Despite the name, this color isn't really Tiffany blue; it's more green. I don't usually wear colors like this, but it's a fun change! The polish is thick and nicely pigmented. It feels high-quality. 5. KIND Snacks Healthy Grains Bar - Maple Pumpkin Seeds with Sea Salt -- This bar was way better tasting and much more filling than I expected! I've bought other flavors in the past, but I'll definitely buy this one when I come across it. 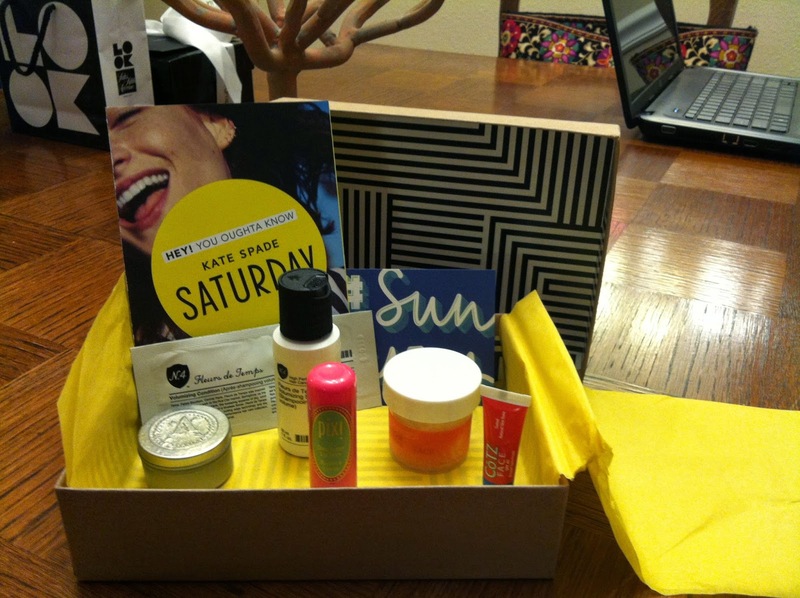 Here is my May Birchbox. For starters, I am loving the color scheme! These look like some really great products - excited to try them.